Even when I was a young boy, I was captivated by history. It contained romance, adventure, murder, and travel. As I became older, my interest never waned. Choosing teaching as a career, at both the elementary and secondary school levels, I shared my fascination with the students. The ancient Romans and Greeks likely never recovered from my treatment of their noble history. When I became a member of the faculty of the Lakeshore Teachers’ College (York University) and the Ontario Teacher Education College, I had the opportunity to share my love of history with promising young teachers-to-be. Today, I hope that they have forgiven me for the sin of believing that history, especially Toronto’s, is fascinating. During the 1970s, I conducted walking tours of Toronto’s historic districts for university students, during the days when such tours were rare. The tours included Chinatown, Kensington Market, historic town of York, and the Necropolis Cemetery. Now retired, I live in downtown Toronto, within walking distance of Toronto’s historic neighbourhoods. Since retiring, I have written twelve books, all of them employing the history of my native city as either the subject or for the background of the story. Two of my most recent publications explore Toronto’s old movie theatres. 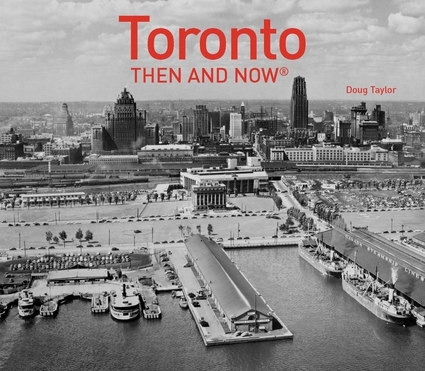 The book “Toronto Then and Now” contains numerous photos, archival and modern, to compare the city—past and present. My most recent publication is entitled “Lost Toronto, “ a richly illustrated book that brings some of Toronto’s most remarkable buildings and much-loved venues that have either been demolished or butchered beyond recognition.Thus, I continue to promote the history of a city that I love. Seven of the books about Toronto are available on Amazon.com and at Chapters/Indigo sites, in both electronic and paperback editions. Toronto’s Theatres and the Golden Age of the Silver Screen. The story of the old movie houses of the city, from the early days of the nickelodeons to the grand movie palaces that followed them. There are over 80 photographs, both archival and modern, depicting the facades and the interiors of these theatres. Relive the days of these wonderful theatres, through anecdotes from those who attended them. Theatres in this book include the Odeon Carlton. Imperial, Loew’s Uptown and Loew’s Downtown, University, Odeon Humber, Odeon Fairlawn, Odeon Hyland, Odeon Danforth, Tivoli, Nortown, Biltmore, Eglinton, Kent, Colony, Grant, Paramount, St. Clair, Lux, Victory, Astor, Oakwood, Broadway, Town Cinema, Oriole, International Cinema, Bay, Ace, Photodrome, Bedford, Hudson, Park, Belsize, Royal George, Oakwood, Vaughan, Scarboro, Donlands, Scotiabank, Paradise, State, Beach, Madison, Shea’s Hippodrome, Downtown, Willow,Metro, Kingsway, Royal, Runnymede, State, Hollywood and many others. A humorous story of young immigrant brothers and their mischievous grandfather in Toronto during the 1920s. The young men arrive in the city during one of the most dynamic decades in its history. They explores the sinful entertainment venues that confront them daily, much to the chagrin of the prim and proper mother. The Villages Within – An irreverent history of Toronto that no school student should be allowed to read. On a more serious vein, the book contains detailed studies of The Kings West District, the Kensington Market, Queen Street West, and the historic St. Andrew’s Market. This non-fiction book was nominated for the 2011 Toronto Heritage Awards. A mischievous tale of a family coping with the horrors of the Second World War, while their son, Tom Hudson, struggles to learn the secrets of “the big boys.” It is a humorous tale of a boy coming-of-age in Toronto during the 1940s. The book contains many historic photographs of Toronto during the 1940s. A Chilling Toronto murder mystery, where a serial killer haunts the streets and dark laneways of 1950s Toronto. The police discover that the blood has been drained from the victims. The convoluted plot leads to a surprise ending that most readers will not expect. The third volume in the trilogy is not yet available. Difficult economic conditions force his family to immigrate to Toronto, Canada, where he confronts diverse and amusing characters, as well as difficult decisions. Eventually, Billy attends a local Salvation Army church, where he trades his fists for a trumpet. The Salvation Army becomes an integral part of his young life as he ponders the great God/mystery. “When the Trumpet Sounds” is an emotionally powerful story of an immigrant family, their struggles to survive in their new life in Canada, and their attempts to understand why God did not prevent the sinking of the Empress. This book can be ordered at Amazon.com and at Chapters Indigo. Electronic copy of the book are available at $7.99. This book explores 75 of the city’s historic sites, using archival images to portray the way they were in past decades and modern photos to show how they appear now. A concise text tells the story of each site and its relevancy in the modern era. For further information follow the link: here. Another book about the old theatres, published by Dundurn Press, contains 80 of Toronto’s former movie theatres. It is entitled, “Toronto’s Movie Theatres of Yesteryear—Brought Back to Thrill You Again.” It contains over 125 archival photographs and relates interesting anecdotes about these grand old theatres and their fascinating histories. Using detailed archival photographs, “Lost Toronto” recaptures the city’s lost theatres, sporting venues, bars, restaurants and shops. This richly illustrated book brings some of Toronto’s most remarkable buildings and much-loved venues back to life. From the loss of John Strachan’s Bishop’s Palace in 1890 to the scrapping of the S. S. Cayuga in 1960 and the closure of the HMV Superstore in 2017, these pages cover more than 150 years of the city’s built heritage to reveal a Toronto that once was. Official publication is Jan. 18, 2018. Link to order this book is not yet available. Writing books exploring Toronto’s history has not been my only attempt to preserve the city’s past. In the late-1960s, I commenced sketching scenes of Toronto and transferring them onto canvas. In many instances, I painted on location, setting up an easel on the sidewalk or any spot that provided a view of the subject. I employed a similar approach when painting Ontario landscapes. In the 1970s, I left teaching for two years to paint full time. Then, requiring money, I returned to teaching and taught art for several years, as well as history. View of the Toronto skyline from Centre Island in 1984—16” x 20”, acrylic on stretched canvas, painted 1989. Though self-taught, I commenced exhibiting professionally at the Ampersad Gallery on Avenue Road and the Hidden Gallery in Yorkville in the 1970s. Both of these have since closed. As well, I exhibited at a few other galleries throughout the city, including the York Woods Library Gallery and the Mississauga Central Library Gallery. I also mounted a 30-piece exhibition in the main gallery space of the Toronto Dominion Bank Building. “Many have compared Doug’s style to the Group of Seven. This is true only in the sense that he paints landscapes in a Canadian Impressionistic manner. Any comparison ends there. Although obviously influenced by Lauren Harris and A. Y. Jackson, Doug has developed his own method of translating the living landscape onto canvas. Hidden Grove, Humber Valley—“16 x 20”, acrylic on stretched canvas. for Simpsons until they installed automatic ones. Thanks for the books, I’ll look them up for some good enjoyable reading and history of my ‘home’ town. Hi I am so happy to see your site. Our family The Littlemores lived at 494 Lauder Ave. and we went to D B Hood too. I am 78 this year so I have all the same memories as you. You probably knew my brother Ron. There were three kids in our family Ron 1933, me Ruth 1935, and Mary 1936. I well remember the 44 storm. Ron went to the top of the street to collect milk and bread off of a wagon. We built a huge pile of snow in the back yard and hollowed it out. Remember the wooden street cars on Rodgers Rd.? I am going to read your books on my Kindle . Sadly my brother died last year he would have loved them I know. bye for now Ruth. Thank you for sending me your comments. I am continually amazed at the contacts I derive from my web site. I don’t recall the name Littlemore. Perhaps I knew you and your siblings as children and I don’t recall. I am now 75, so we are in the same age group. You indeed have many of the same memories as I do, I can easily picture the wooden streetcars on Rogers Road, as well as on Oakwood. I suppose you likely have fond memories of the Grant Theatre too. I am presently writing a book about Toronto’s old movie houses, and found great photos of the Grant, including the interior of it. I hope you enjoy the book “Arse Over Teakettle”. It centres on the streets around Lauder. I had fun writing it, and although many of the stories are fiction, the settings are real. Good morning. Going to the show was an important part of our lives. I remember which theater I saw specific movies. I saw Bambi at the Paramount, The wolfman at the St. Clair, Snow White at the Oakwood and so on. Its wonderful to make this contact and remember that area. Even though I only lived there until grade three those were the things I remember the fondest. I only remember one teacher’s name from Kindergarden. Miss Mainprize. I tried to get the first book on Kindle but could not .I will keep trying. If you departed Lauder Avenue after grade three, then I possibly did not have much contact with you. I went to D. B. Hood all eight years of elementary school. I too remember the theatres where I viewed specific films. I saw Bambi at the Radio City. You may not be able to get the first book of the trilogy on Kindle. However, it can be ordered and mailed to you from the Chapters/Indigo web site. The second book in the trilogy is a murder/mystery. The characters remain living on Lauder Avenue in the story, but it is a brutal tale ( be warned). It is a pleasure to share memories with you. I enjoyed ” Arse Over Teakettle” and wanted to send you some pictures of us on Lauder. Is there a way to do that? Am I missing your email? I was born on Northcliffe ave. I would very much enjoy seeing the pictures of Lauder Avenue. Unfortunately I do not have any pictures of the YMCA. The place to find such photographs would be to search the Toronto Archives on Spadina Rd. Oh my goodness, the memories you’ve stirred here! I was looking for the name of the Nortown theatre because I was having a senior moment. Then to find the Oakwood and others. I remember seeing Ben Hur at the former, and House on Haunted Hill at the latter, tickets purchased by an adult as my friend and I were too young to get in at night. I went to Duncan B. Hood (DB Hood) for Grade 1, then switched to JR Wilcox for the rest of my grade school. I lived on Livingstone Avenue, just north of Eglinton, and not far from Oakwood. I attended Vaughan Rd. CI till grade 12 when I switched to Harvey for the 1 yr commercial program. I often went skating at Cedarvale rink, and saw movies at the Nortown, the Eglinton, the Oakwood and the Colony. (Remember Saturday matinees with Roy Rogers and Hop a long Cassidy, and Flash Gordon.) I am 66, and lived in that area till I was 21. My parents continued to live there another 9 years until they died. I haven’t lived in Toronto since 1987, now in Ottawa, but remember it so well. I always loved the films and columns about 1960’s Toronto, when I was a teen. Attended the Club Bluenote while Al Steiner was still with us. But that’s a whole other story! Hi Doug, just stumbled a cross your site as I’m a “lover” of history, especially of my hometown! I really enjoy all that I’ve read and am going to look for your books! Your first blog on the corner of King and John, the “unmentionables” warehouse, was a great read! I’m a firefighter in the big Adelaide station right in behind there and that’s our main Tim Hortons stop! Lol. It was great to find out more about the building I’m in all the time! The side story about the York hospital in the peice and the Irish famine victims was a great touch! I’m a lover of Irish history as well and it’s great you used your story to tell the important tale of those poor souls! If your interested, there was a really good two part documentary done by RTE in Ireland called “Death or Canada” about the hospital and the Irish emigration to Canada! It follows the dig that was preformed on the site before they broke ground for the TIFF building. I’ve had it for a few years in my collection of Irish programs! Like I said, great work, I’m going to explord a little more! Many thanks for your comments about a post on my blog. I was born in Toronto, love the city and I am fascinated by its history. It is always gratifying when I learn that someone else feels the same about Toronto. I just came across this site and read your message. Seems like you are very interested in the Irish. I am as well….being that my grandparents on both sides came from Ireland. I will have to read Doug’s book on that history of the Irish. What is the name of it? Also, there is St. Paul’s Basilica, located near Parliament and Queen, which has a cemetery at the back for the Irish immigrants who came over by boat and unfortunately died. Again, lots of history in Toronto. I love hearing and reading about it. Doug, I saw a link to your post on Toronto Theatres from FB Vintage Toronto. I, too, am fascinated by Toronto’s history and don’t understand the decision making for destroying such great architecture. I’ve managed to see films in some of these theatres while they were still around. I can’t wait to get a copy of “Toronto Theatres and the Golden Age of the Silver Screen”. Being an employee of a big cinema chain and a history buff; I am also looking forward to your new book, it will be a perfect addition to my library. So glad I found this site. I came to Canada in 1953 as a 6 yr old with my parents, and lived in the Weston Rd./Humber Blvd. area. It was nice to see the old Mount Dennis theatre, and was wondering if you have any information of the Mount Dennis history. In the meantime, I look forward to reading your books. I just came across this site and so glad I did! I was born and raised in Toronto and love delving into it’s history. As they say – “if walls could talk”. I will certainly read some of these books and will check back often. I spent many weekends in the projection booth of the Casino Theatre where my grandfather was the projectionist. Any knowledge of photos of that theatre or it’s workers? I had a comment on one of the TIFF posts about using some of your images. I look forward to your response. Thank you. Re the Mayfair Theatre. We lived in the Junction during the ’50’s, attended Annette P.S. & Western H.S. but had many friends who attended school at Runnymede, Humberside, Parkdale, Royal York, Etobicoke, C. I., etc. Enjoyed times at Mayfair and others (Runnymede, Parkdale Odeon, Humber Odeon, Kingsway, State, Beaver, Apollo, West End, Crescent, etc) on several occasions. Always recall the Mayfair as the Mayfair during that decade at least. Spent several hours in the Dairy Dell and I vaguely recall the family name of the then-ownership as Dimitroff?? Nearby Baby Point clubhouse was a site for some special birthday occasions. If you attended Runnymede C. I. at one point, do you recall names of any school mates?? Thank you for this work, Doug ! My Grandparents were at the opening party of the Royal York hotel. I have the table favour given to all female guests. It is lovely. My Aunt played piano at the Victory Theatre on Spadina for silent movies. Hurricane Hazel was both terrifying & fun. Sadly, I can not offer you a single photo. Hey Doug. Awesome site. Pretty sure that the portrait of the woman next to Mackenzie in the Queen Street subway station is Nellie McClung and not Mackenzie’s wife Isabel. It was painted by John Boyle and commissioned in 1980. Loved your Villages Within. Wondering if you have anything dealing with the old Kew Beach Fire Hall. 1904 Queen St East. I am research the history of this old station or if anyone out there has information, photos even the old Kew Beach Fire Brigade that was down near the Lee Ave & Queen st E Park. I am wondering if you might have any information about the old York County Police force. My father was on that force as a clerk when he was 20 years old, and eventually he was a detective and fingerprint expert, if my poor memory serves me correctly. I vaguely recall a story from my youth about his having to put a corpse’s skin over his own fingers to roll the prints. I believe the headquarters was in downtown Toronto. My father, in 1938, compiled the ‘First Annual Report of the Chief Constable of the County of York’. He left the force in the mid ’50s and became a taxi cab owner of 3 cabs, and one of the drivers. He had his own small company, originally working out of a gas station basement at St. Clair and O’Conner Drive. There may have been other names at one time, but the one I remember was Grover Taxi (or Cabs). He made his own rooflights…..an upside down triangle. As kids, my older sister and I delivered calendars for his business in East York. Hello. Here’s a strange thing: We live in an apartment on St. Clair at Lauder. We have had some strange occurrences since moving in three+ years ago. Being so richly steeped in local lore, I was wondering if you had ever come across a history of a murder or tragic death at this address (we are above the Fox and Fiddle). We’re not scared, per se, more curious. Any info would be nice. Thank you, Adrian and Aspurçe. Love your home page, all your pics are a lovely walk down memory lane, thanks. I enjoy reading your posts but always fall victim to the sadness that ensues… about the city you write about that no longer exists. I am 44 and I am pained by the changes taking place… I just finished reading the post about Stollerys. Oh that intersection was so special to me and recently visiting it again was shocking. Maybe it’s age sinking its teeth into me or “the future” that consumes us all. I, like many I’m sure, get locked in the past; memories are a blessing and curse… anyways, thank you for telling the stories and allowing me to remember a time that isn’t today… perhaps like taking a vacation that you’d wish would last forever. Glad I came across this site while I was searching for something else. Since you are so versed in the history of Toronto, I wonder if you know the name of an airport that used to be on Dufferin St. between Lawrence Ave. and the Yorkdale mall on the west side. The only remaining building that I know of is the Katz Deli which I hear is now closing. Leavens Aircraft Supplies used to be in the building before Katz Deli.